I am a terrier, through and through. My name was chosen because of my ability to retrieve vermin from the small openings in stone grave markers (cairns). I am independent, intelligent, and very active. My small size is very well suited to apartment living, but I do enjoy the outdoors and like to go for walks. One of my favorite things to do is to help you transplant some of your flowers and shrubbery. I don�t have any problem at all digging them up, but I do have a little trouble re-planting them by myself. You�ll have to watch me to be sure that I don�t dig them up until you are ready!! When fully grown, I am between 9 and 12 inches tall (22.9 to 30.5 centimeters) and I weigh between 13 and 16 pounds (5.9 to 7.2 kilograms). We have no Cairn Terrier Breeders listed at this time. 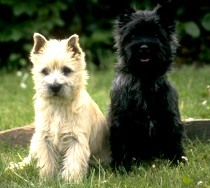 Click here to place your Cairn Terrier Ad!